Jessie Chung is back with her latest studio album There You Are. Mastered and produced in Australia, the breakthrough album fuses indie rock and modern sounds. Autumn of 2016 sees Jessie Chung launching her debut English album There You Are, blurring the lines between indie rock, purist pop, and R&B-esque sounds. Each and every track on Jessie’s album is a glimmering gem hidden with stories drawn from her person experiences. Jessie enlists Australian producer Andy James Court (fresh off his success with Fireplace) to help complete the envisioning of her musical stories. The single Drive My Heart features a propelling midtempo rhythm that blasts along with fiery guitars on epic overdrive and pommeling drums. Her unabashed voice laces a searing emotional wave to the hi-octane anthem. Despite Jessie’s girlish, tender vocal, her songs display versatility and maturity, and is sure to electrify any music generation alike. Jessie Chung is a Malaysian singer, actress, author, entrepreneur and a doctor (M.D. in clinical Oncology). She has been performing as an artist for many years now and has been on stage in some different countries including the USA, Malaysia, Canada, and China. She has released seven other albums, notably Home, Loving You, Message of Love from the Moon, Love in You, I Just Fall in Love Again, and Tearless Sky. They have all been well received by the media, and she has become a popular artist both internationally and in her home country, Malaysia. Her single “Love in You” was selected as the theme song for the Korean TV series My Secret Garden in Taiwan. 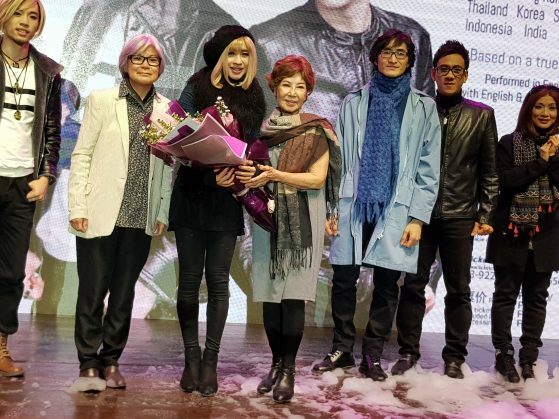 Jessie Chung’s last album rose to 4th place on the I Radio Top Hits Chart and 6th place on the Pop Radio Top Ten Music Chart just within two weeks of her initial release in Taiwan. She has also sung solo concerts in 5 different languages to promote charity events. It was on October 2015 when her Love Unity Concert has yielded huge responses from fans around the world, leaving barely any space in the more than 2000-capacity arena. This year, she has sung for 10 consecutive full house shows for her Chinese Orchestra concert. Besides, her stage production Moonlight was also well received, extending to a total 10 shows. Follow Jessie Chung on: Facebook: https://www.facebook.com/jessiechung….